RsDb stands for "Really simple Database" : a lightweight RDBMS (Relational Database Management System) designed for Unity 3D. 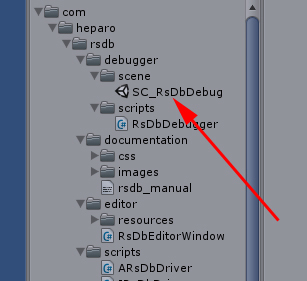 Getting started with RsDb is quite easy but needs some piece of code. The safe and quick approach is to instanciate in a GameObject script a driver in order to access the desired database(s). You can open any reasonnable number of databases. You can combine both strategies to access them. Yes, that means both drivers share the same static list of opened databases. In this example, we will deal with [MyScript] extending [MonoBehaviour] we need : an instance of [RsDbDriverAsync] and [RsDbDriverListener] and register the listener. We have now to implement the event management part using the listener's methods. In practice, each call to any delegated update-like method will check the listener for new events generated by the driver. DRIVER_LOAD_EVENT : the database was just successfully loaded (or created empty) and its index in driver's repository must be kept ! Once processed, an event must always be consumed in order to deal with the next awaiting event : indeed, a listener enqueues events for all opened databases. // A new event to consume ? In practice, it is always wise to use a try and catch block (strongly recommended when executing a statement). One last word : both drivers share the same static list of opened databases, yes. But the async driver will create others objects to manage requests (jobs). If you plan to mix both strategies, it is then better to open a database first with the async driver. In this example, we will still deal with [MyScript] extending [MonoBehaviour] and we only need : an instance of [RsDbDriverSync]. 3 - And beyond ? Well, normally the goal is to retrieve data through executing SQL statements, isn't it ? To do so, please, take the time to explore The SQL Spellbook and give a sharp look at the Scripting APIs to incorporate RsDb in your project. Also, the debugging script (RsDbDebugger.cs) and the editor script (RsDbEditorWindow.cs) provided with this package may be helpfull. A demonstration scene is provided with the package. It's a debugging / unitary test example that will generate a database. 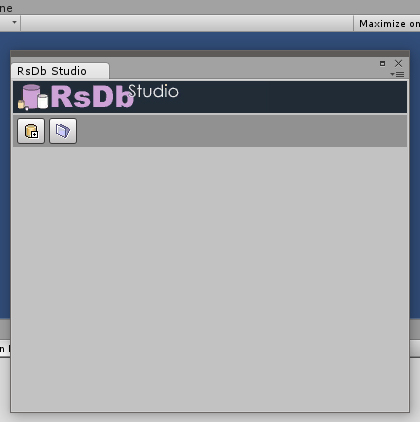 The RsDb Studio is a graphical editor extension. 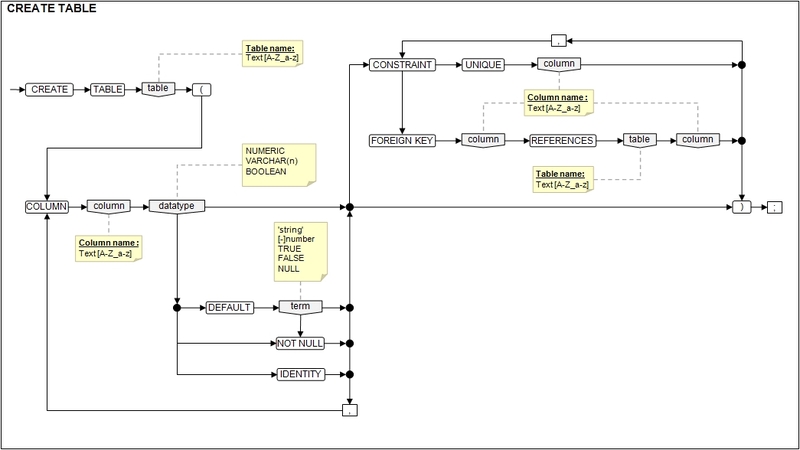 This tool allows the user to view the structure and content of RsDb databases, browse the data, execute SQL statements, etc. A new dockable and resizable window is created. 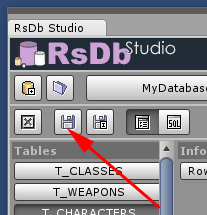 Click on the [New Database] icon then enter a name and a folder for your database in the modal file chooser window. The default extension is [.rsdb] but you can use any other suitable one. 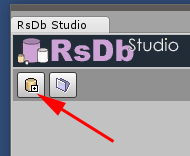 Click on the [Open Database] icon then select the file corresponding to the database to open. The default extensions are [.rsdb] and [.sav] but you can use any other suitable one. This is the default for an existing non empty database. As we can see in this picture, the [Data mode] is selected and the tables are listed on the left. None being selected, the right part is left blank. You can freely open various databases in the studio and switch from one to another using the toolbar as shown above. 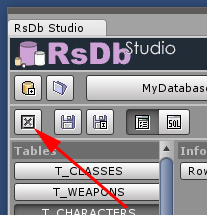 Click on the [close Database] icon in order to close the currently selected database. You will be prompted to confirm your choice. 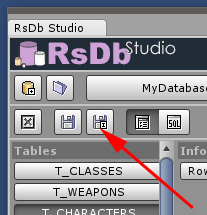 Click on the [Save Database] icon to save the currently selected database. Click on the [Save Database] icon to save the currently selected database using a different name (by showing a filechooser modal dialog). Note that the original archive is not modified nor deleted. Click on the [Data mode] icon in order to activate the corresponding mode. This is the default view for the [Data mode] of a non empty database. The tables are listed on the left. Note that the system tables are not included : they have to be explicitely interrogated through an SQL statement. In order to explore the content of a table, just select one in the list. 9 - What ? The content of my cell is truncated ! The width of the columns is fixed in order to keep the things simple. A layer containing the selectable content of the cell appears. Use the [Close] button to hide it. Use the [Copy] button to copy the full content of the area to the system clipboard. This feature is available on any cell of any displayed result in any mode. 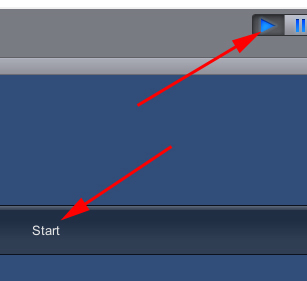 Click on the [SQL mode] icon in order to activate the corresponding mode. Due to some "limitations" with the text components, two SQL modes are available ! Indeed, in one mode you are able to copy and paste content... without being able to execute any statement : it's the editon submode. And in the other one, you are able to select a particular SQL statement and execute it, of course the text is still editable : it's the execution submode. 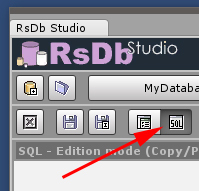 Click on the [SQL edition mode] icon in order to activate the corresponding mode. Click on the [SQL execution mode] icon in order to activate the corresponding mode. In SQL execution mode, select the statement to be executed then click on the [Execute] button to start execution. 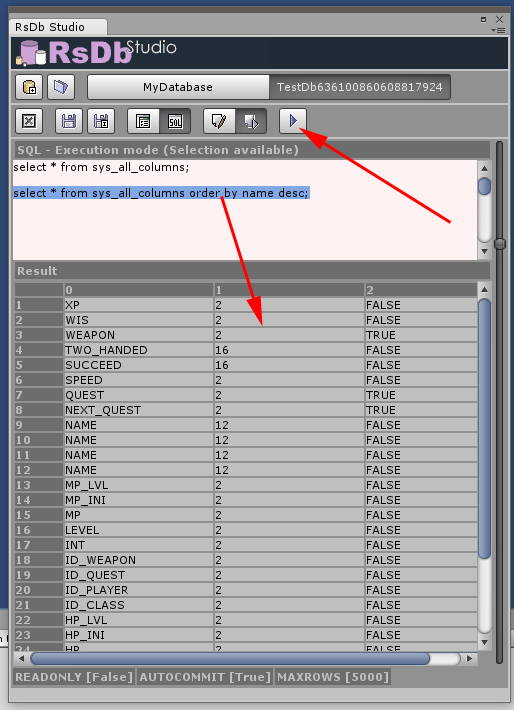 In SQL execution mode, select the statements to be executed then click on the [Execute] button to start execution. A batch of SQL statements is a group of two or more SQL statements separated by semicolons (;). They will be executed asynchronously and sequentially. In SQL execution mode, when [AUTOCOMMIT] is set to off, two new buttons become visibles : one for [COMMIT] and one for [ROLLBACK]. This section contains the description of the SQL (Structured Query Language) used to manage information in a RsDb Database. VARCHAR(size) Strings having a variable length bounded between 1 and 65536 (64ko). BOOLEAN Having two values (TRUE and FALSE). [-]number The minus operator is the only arithmetic operator implemented in RsDb. DEFAULT DEFAULT is used to replace any omitted or NULL value provided in an INSERT or UPDATE statement for the column. Of course DEFAULT must be compatible with the SQL type of the column. NOT NULL Regardless of the type of the column, a value must be always provided unless a DEFAULT value was declared for the column. IDENTITY An IDENTITY column can only be NUMERIC. It auto-increments itself by one on any INSERT statement. First value is one (1) by default. It can't be updated. It thus acts as a sequence. Any value provided in an INSERT statement for such a column will be substituted by the current sequence value. An IDENTITY column adds a UNIQUE constraint automatically. UNIQUE Means that each value in the column can't repeat itself. Internal ID is 0 for the UNIQUE constraint. FOREIGN KEY All the fields of this column will REFERENCE the values of a FOREIGN table.column (a symetric constraint is declared for internal use only). The FOREIGN table.column should strongly have a UNIQUE constraint on it. Both columns should also share the same type. Internal ID is 1 for the IMPORTED KEY constraint (for the column that uses another column as reference). Internal ID is 2 for the EXPORTED KEY constraint (for the column that is referenced by another column). NOT NULL Can not be verified on a non empty table : will ALWAYS raise an error ! IDENTITY Can not be verified on a non empty table : will ALWAYS raise an error ! 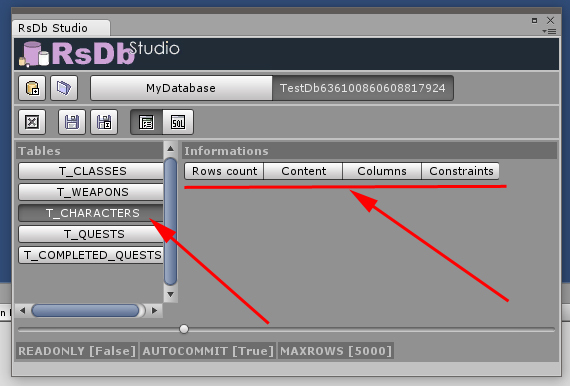 Note that when dropping a column, all the constraints using this column are removed too. Note that when dropping a table, all the constraints using a column of this table are removed too. A successfull UPDATE statement will return a result object (RsDbResult) containing all the modified rows. As a good practice, it is always recommended to turn AUTOCOMMIT to FALSE when updating. 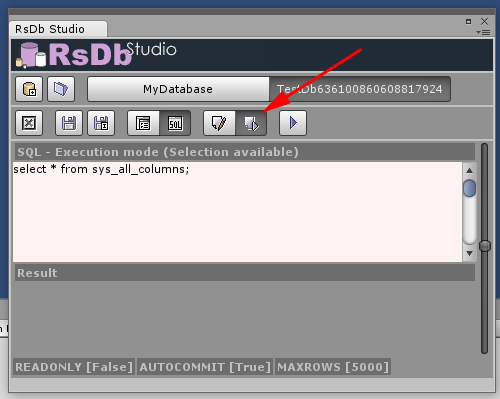 A successfull DELETE statement will return a result object (RsDbResult) containing all the deleted rows. As a good practice, it is always recommended to turn AUTOCOMMIT to FALSE when deleting. In this section are described all the suitable classes for a normal and happy integration of RsDb in a project. This class is the convenient object to instanciate in order to use the RsDb system in an asynchronous way. Any client class must register a listener with it in order to reveive event notifications and prior to any database manipulation. Process with an execution event (invoked by another thread in a callback mode). This method should never be invoked directly. Process with a save event (invoked by another thread in a callback mode). This method should never be invoked directly. Process with a loading event (invoked by another thread in a callback mode). This method should never be invoked directly. Process with a close event (invoked by another thread in a callback mode). This method should never be invoked directly. 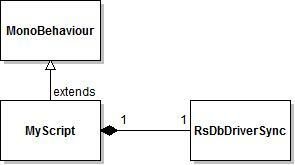 Process with an exception event (invoked by another thread in a callback mode). This method should never be invoked directly. 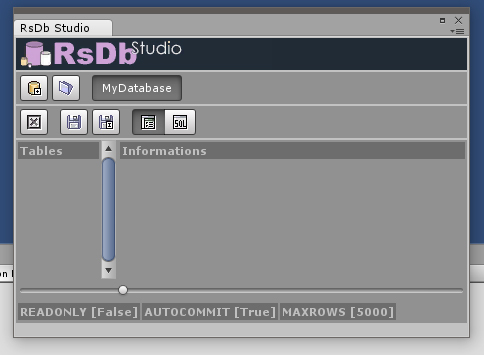 This class is the convenient object to instanciate in order to use the RsDb system in a synchronous way. This class represents the result returned after executing a statement that queries the database. This class represents an event fired by a RsDbDriver to all its listeners. 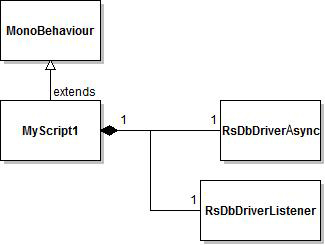 This class represents the abstract class for the drivers of the RsDb system. Get the number of opened databases in the repository. Get the database at the specified index. - index : the index of the desired database to retrieve. - the database object corresponding to the index in the repository. Get the name of the database at index. - index : the index of the database. - the name of the database corresponding to index in the repository. Get the list containing the names of all the databases. - a list containing the names of the databases. Get the index of a database using its name. Commit a transaction (or a set of transactions) for the database at specified index. Rollback a transaction (or a set of transactions) for the database at specified index. Is a database in autocommit mode ? Is a database in read only mode ? 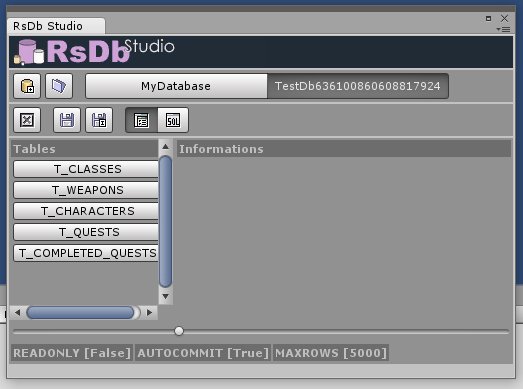 Unity will throw numerous exceptions on to the console : this won't crash the editor but will be visually annoying. However, it is true that GUI components (TextArea for example) have a limited displayable text size ! 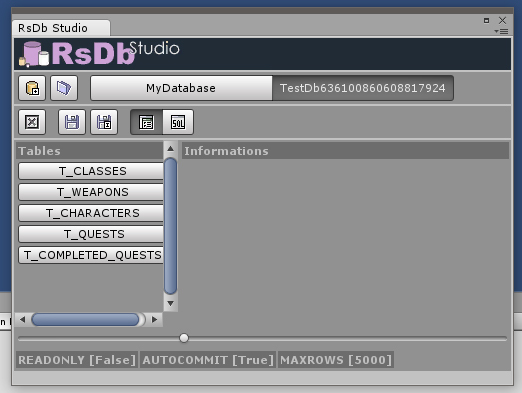 You can freely see it with demo database, text is truncated (table view or detail view), using Unity 4 or 5. 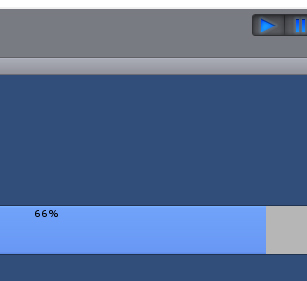 This is a 'view' problem (Unity GUI components), not a data alteration problem ! Note that, the SQL text area il too limited. Please, do not forget to place [RsDb] at the beginning of your mail subject.